The Bullfinch external shower point (with temperature control) - white - ideal for outdoor showers, washing articles and pets and comes complete with a Shower head assembly (shower fitting, shower hose and swivel head) and fixing screws. 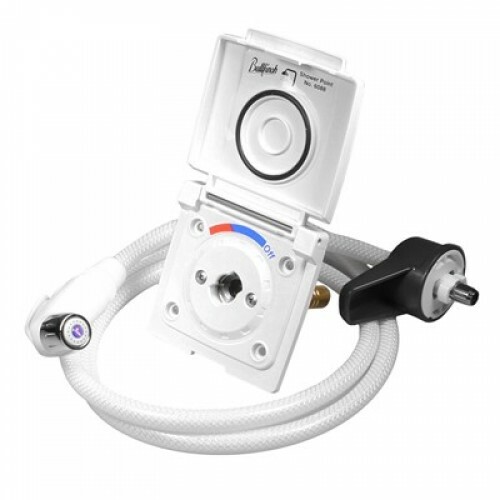 The External shower point comes complete with a Shower head assembly (shower fitting, shower hose and swivel head). It uses the unit’s existing hot and cold-water supplies. Inserting the shower assembly, locks it in place and turns on the water. Temperature adjustment by turning the assembly. In winter take care to drain down the shower unit to prevent damage from freezing water. 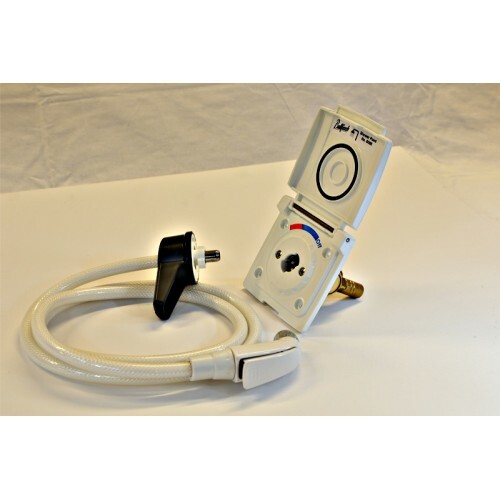 For micro-switch activated water systems, you will need to install a switch for the pump for the Shower Point. We suggest an illuminated switch just inside the door to remind the user to switch the pump off when the Shower Point is not being used. For on demand pressure pumped water systems the Shower Point can be installed as it is, without the need for an electrical switch.